Hushcloth® Acoustical Foams are designed to provide maximum absorption of airborne sound with minimum thickness and weight. These flexible open cell foam products are manufactured to optimize pore size, air flow resistance, and density. Sound energy, passing through the cell structure, is converted into minute quantities of low grade heat that is easily dissipated. Since the uniformity of the cells is carefully controlled the acoustic performance is predictable from one installation to another. Many applications require these products to be subjected to environments such as dirt, moisture, chemicals, and abrasion that could be hostile to unprotected foam. 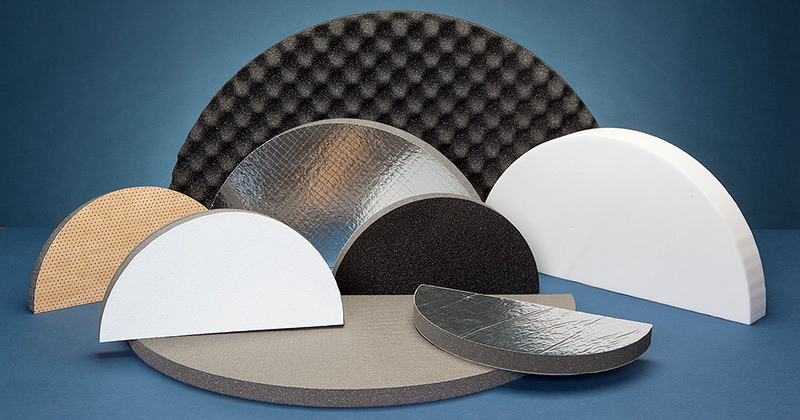 American Acoustical Products has developed various surface treatments to protect the integrity of the foam from these elements. These facings will increase the absorption properties at certain frequencies as well as provide a cleanable, decorative and durable finish for a wide variety of applications. Hushcloth® Acoustical foams (HC) (-40° - 225°F) are either Polyester, Polyurethane semi-reticulated foam or Melamine, designed to maximize the sound absorption properties. Hushcloth® Aluminized Polyester Faced foams (AP) and Scrim Reinforced Aluminized Polyester Faced foams (RP) are designed for hostile environments where cleanliness is of concern. Hushcloth® Black Urethane Faced foams (BU) with additional protection on the exposed surface to reduce the ingress of foreign matter. Hushcloth® Convoluted foams (CV) Enhanced absorption properties by increasing the surface area for a given bulk of foam material. Hushcloth® Densified Embossed foams (EM) are designed to create an asymmetry in the airflow resistance of the material which enables sound absorption properties in thin foam systems normally associated with much thicker sheets. Hushcloth® Perforated Vinyl Faced foams (BP & SP) have durable "Leatherette" facing materials which combined with the absorption properties of the foam creates an enhanced low frequency absorption material. Polyimide fire-resistant foam products provide extra characteristics: Military Grade Fire Resistance, very low smoke, wide temperature range and virtually no out-gassing. Hushcloth® Melamine foam (M) (-45° - 302°F) is a light weight high temperature fire resistant open celled foam.